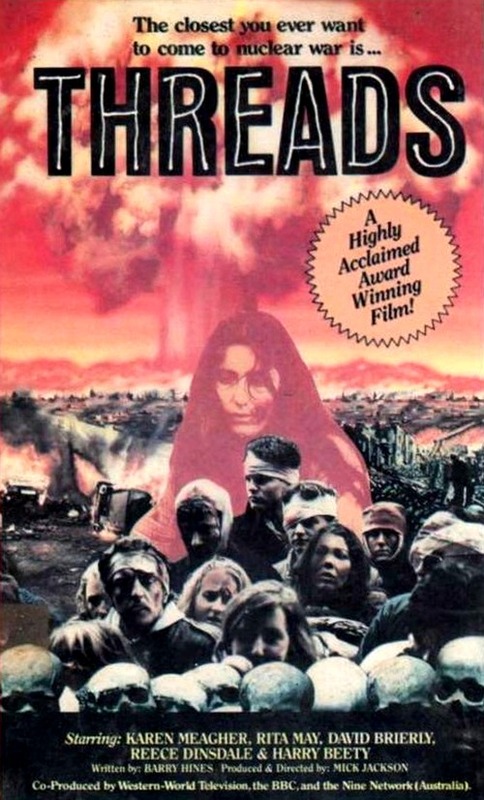 threads dvd 1984 British End of the World movie like "The Day After"
Threads is a British television drama produced by the BBC in 1984. Written by Barry Hines and directed by Mick Jackson, it is a documentary-style account of a nuclear war and its effects on the city of Sheffield in northern England. Filmed in late 1983 and early 1984, the primary plot centres on two families, the Kemps and the Becketts, as an international crisis between the United States and the Soviet Union erupts and escalates. As the United Kingdom prepares for war, the members of each family deal with their own personal crises. Meanwhile, a secondary plot centered upon Clive J. Sutton, the Chief Executive of Sheffield City Council serves to illustrate for the viewer the United Kingdom government's then-current continuity of government arrangements. As open warfare between NATO and the USSR-led Warsaw Pact begins, the harrowing details of the characters' struggle to survive the attacks is dramatically depicted. The balance of the story details the fate of each family as the characters face the medical, economic, social, and environmental consequences of a nuclear war. As pseudo documentaries go, there are few to none that can top Threads, and despite being made in the 1980s, it is still as relevant today as it was back then. The abject realism and the way each character's plight is depicted is harrowing and grisly at times. Docu-dramas like Threads are much more horrifying than any slasher, gore film, or supernatural chiller could ever be, as the way in which the events play out seems all too real, plus the emotionless matter of fact tone that the happenings on screen are presented and narrated makes it all the more powerful. .